This is our Halloween Themed bounce house rental. This bounce house rental features a large and spacious bounce area as well as a sfety ramp to keep your kids hands and feet free of bumps, scrapes and bruises. 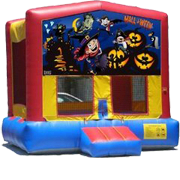 The Bounce house features a High Quality panel with HD graphics for your Halloween event or party. This bounce house will put your party over the top!